Many small to mid-sized businesses utilize a hosted digital phone service to extend their reach in the marketplace and move beyond the walls of their offices by going virtual with their workforce. Utilizing a hosted digital phone service can help facilitate this mobilization while providing the impression that you are all under one roof. Out of State Employees - one customer has employees that office out of state, yet they want to have the appearance that they are in town. They were provided phone numbers local to the corporate office so their outbound caller ID appears as if they were calling from the corporate office. Also, from the company perspective, these employees appear like they were on the same phone system. Thus, the receptionist or other employees can simply dial the extension to reach them. Additionally, they have been able to consolidate their phone service under one provider and save money. Finally, because we, like many other VoIP providers, provided unlimited local and long distance calls, they no longer pay for long distance charges for calls made to their own employees! Multiple Branches, One Receptionist - Another company we serve has multiple branch offices across the country and in Canada. Phone calls coming into the corporate office or via their toll free line can be handled by a single receptionist (or automated attendant if they choose) and routed to the branch location closest to the caller. Again, this customer benefits by having all of their branches on the same phone system handled by the same service provider. They are also able to have phone numbers specific to the branch locations. Call Center at an Off-Site Location - Another company determined that they could establish a call center in a different city where the resources were more plentiful and less expensive than in their headquarter location. However, they wanted to have phone numbers assigned that made it appear that these customer service reps were in the area. 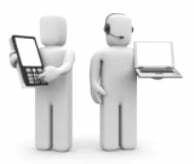 Hosted digital phone service allows for this, as well as provides for extension dialing or call transferring to headquarter employees as required by the call center reps.
Work at Home Sales Force - I'll talk about our company, sipVine, for this. We have representatives located throughout our metropolitan area as they operate out of their homes. We deploy the "hotel" concept for days when they come to the office. Thus, we do not have to add unnecessary costs to our business by adding square footage as we have grown. The reps have a digital phone at their homes that simultaneously rings their phone at the office. Wherever they pick up the call is where the call is delivered. Additionally, we have their calls simultaneously ring their cell phone, with an indicator so they know it is a business call. So, our team can always be reached and they don't waste valuable time driving into the office everyday. I hope this provided you with a few ideas of how a hosted digital phone service can help you go virtual with your workforce. Please comment.